The GlobalShop 2018 theme was “Inspire Retail”. 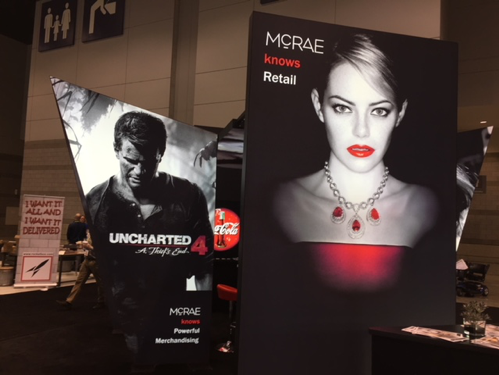 Our booth’s goal was to inspire and connect with GlobalShop Attendees. One of our core values in innovation and we strive to embody this value throughout our company – from the manufacturing methods to equipment investments to our multidisciplinary experienced team. 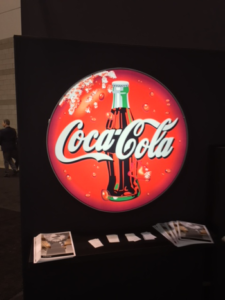 We have perfected the circle lightbox from the light distribution and fabric stretch, to the curved extrusion and quality of the actual image. Our graphic and fabric printing expertise shines through due to our proprietary VIVID fabric. VIVID took extreme care over a period of 3 years to create the exact fabric our customers are looking for. This fabric has been uniquely designed to make our customers happy in terms of performance, cost, brilliance and color saturation. As the guests at our GloablShop booth got to witness, the colors explode off this fabric! Please email us at the address below if you would like to discuss our fabric printing process in greater detail or would like us to send you a VIVID sample. This was a huge trend this year. We have made ours to be cost-effective, meaning it can fit into the budget, even for retailers with larger spaces. Our process of crafting and designing our lighting motions and effects is completely science-based and measured to the highest degree in our state-of-the-art lighting lab. 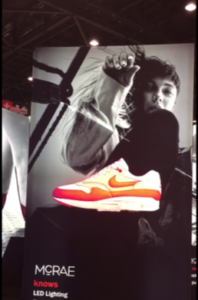 The guests at our GlobalShop booth got to see this shoe change color and pop like a 3D image in the photo below. Fabric Lightboxes - What to Look for in a Fabric Lightbox Manufacturer?